Diamond is just one form in which elemental carbon can be found. Other forms include graphite, lonsdaleite and fullerenes. Graphite is a mineral that, like diamond, is composed of carbon. However, the carbon atoms in graphite are arranged in a different way than they are in diamond. There are significant consequences for the relative properties of diamond and graphite. Graphite is not nearly so hard as diamond. It has a hardness of about 1.5 on the Mohs scale, compared to diamond's 10 rating. That difference is related to the fact that graphite is composed of separate sheets, called graphene sheets, whereas diamond is firmly bonded in three dimensions. A force exerted on graphite can easily displace one layer away from its neighbours. However, graphite isn't equally hard in all directions. If a force is exerted parallel to the graphene sheets, one sheet can be moved with respect to the next one. That isn't true perpendicular to the sheets. On the picture, the sheets could slide on the x and y directions but not in the z direction. That general idea is true in other materials. Even diamond is not equally hard on all surfaces. Minerals often have typical shapes because they are cleaved more easily along specific planes, but are harder to break along others. 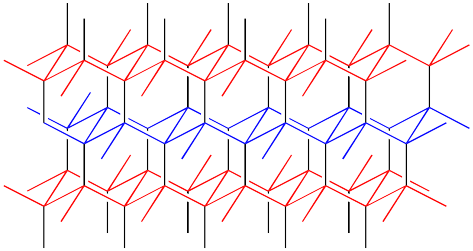 Other properties also depend on the plane of the crystal in network solids. 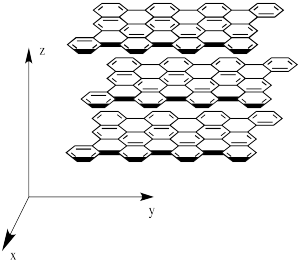 For example, graphite is also a conductor of electricity along its graphene planes, but not perpendicular to them. Lonsdaleite is named in honour of Kathleen Lonsdale, the Irish crystallographer who first demonstrated the planar structure of benzene via X-ray diffraction. It is a very rare form of carbon generated during the impact of meteors that contain graphite. In the high energy of impact, layers of graphite fuse together to form a structure that at first glance looks a lot like diamond. 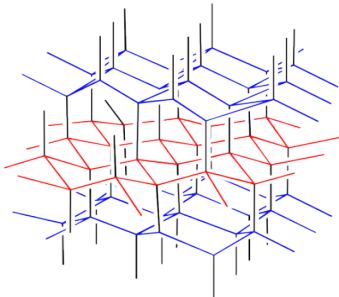 A rough sketch of the lonsdaleite structure is depicted below. The structure is depicted in colour in order to more easily draw the distinction between lonsdaleite and diamond. A similarly coloured structure of diamond is shown below. Note that in diamond, the layers of carbon atoms form wavelike structures. 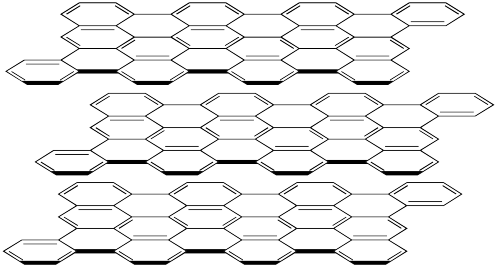 These structures are repeated from one layer to the next, although the layers shift a little to the side with each new row. In lonsdaleite, the layers of atoms form a similar, wavelike structure. However, alternate layers run in opposite directions in lonsdaleite. Lonsdaleite formed in nature is much softer than diamond, probably because the chaotic nature of its origin leaves lots of graphite-like domains embedded in the lonsdaleite. Instead of having bonds regularly spaced throughout the material, there are probably flawed portions in which part of one layer is still unconnected from the next. It has a hardness of about 8 on the Mohs scale. The fullerenes are a form of elemental carbon that really does not fall completely under the category of network solids. They are a little like network solids but they do form discrete units, and so they are really molecules. A fullerene is a little bit like a small sheet of graphite that has been curved into a ball. The shapes of the spherical ones resemble the Geodesic Domes designed by architect Buckminster Fuller in the 1960's; that's where they get their name. Spherical fullerenes are also called buckyballs. 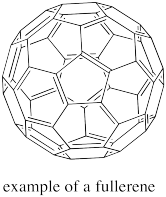 Fullerenes were first discovered in the 1990's by Harold Kroto. There was an ensuing rush to develop new applications for the materials. For example, people have proposed using buckyballs as lubricants (like little ball bearings, they would roll between two surfaces). Much of the interest in this area, however, has focussed on potential electronic properties of these materials. 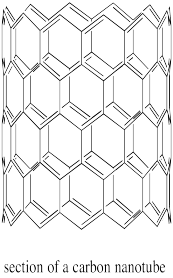 Carbon nanotubes are conceptually similar to fullerenes. Instead of being spherical, they are tube-shaped. They can also be though of as graphite sheets that have been curved into a new shape. Many other forms of carbon that are commonly found on earth are not pure carbon. We often think of coal as being equivalent to carbon, a notion that is reinforced by the common knowledge that diamonds are a result of immense geological pressures and high temperatures acting on coal seams over long periods of time. Coal actually comes in many different grades containing varying amounts of carbon. Lignite or "brown coal" can contain as little as 60% carbon. The rest of it is composed of varying amounts of hydrogen, oxygen, nitrogen and sulfur -- all of which are common elements found in living or "organic" things. The most valuable grade of coal, anthracite, contains over 90% carbon. There are varying grades in between. Why does coal contain all of those elements found in living things? Coal forms from the compression of organic material over geological time scales. Most of the atoms present in that organic material are still present in the coal. Other non-living but organic materials are important ecologically and agriculturally. As plant and animal matter decays, it turns eventually into "humus" (hyoo-muss) or the organic material of the soil. Humus comes from those portions of organic material that are not easily broken down. Humus contains a significant amount of carbon, as well hydrogen and oxygen. DIfferent kinds of soils contain different levels of humus, which confers varying properties on the soil such as moisture- and nutrient-retention. Coal and humus are not exactly network solids. What fullerenes have in common with network solids is a regular, crystalline pattern of covalent bonds extended across the solid, but they are limited in size. Coal and humus demonstrate an opposite case: they do not have a limited size and their bonded networks can extend seemingly endlessly, but there is nothing regular or repeating about their structure. Instead, these materials are "amorphous" extended solids.